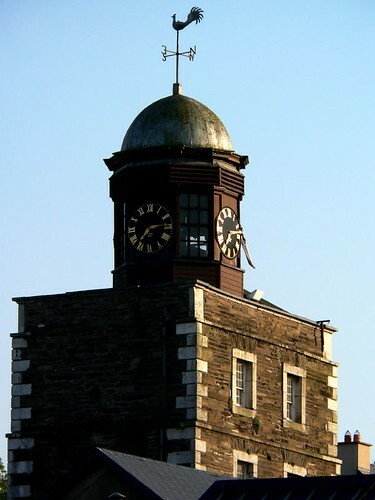 I created this flash live clock from a picture of Youghal Clock Gate. If you keep watching the hands on the clock you will see them move in real time based on your own computer’s time clock, it was an idea I had for a while so if you like it you can download the free screensaver.exe version or the flash movie version from the links below. You are free to use and share these files also there is no malware, spyware or any nasty stuff in any of these downloads, just a bit of fun. In 1777, the town’s Clock Gate Tower was built on the site of Trinity Castle, part of the town’s fortifications. It was used as a prison during the rebellion of 1798, and a pole lashed from the lower windows to the corner of the first house on South Main Street (now Luigi’s) was used for hangings. Thomas Gallagher was one of those hanged for trying to seduce a soldier from allegiance to his regiment. Numerous forms of torture were conducted therein including thumb screws, pitch-cap, rack and the lime boot and flogging. The Clock Gate served the town as gaol and public gallows until 1837 when it was considered “defective in several of the accommodations essential to the health of prisoners”. It then became a family home until 1959 when the last family left. i like very much that screensaver with a flash clock, it was created with creativity and imagination. I like that flash clock because it has a good and old faction style image, and it is seems that the flash clock is in 2D, as in 2 dimensions, is that right? I made a 3D flash clock and i wanted to make sure it is in 2D. Thanks for sharing.